Summer spraying is well under way as growers are once again faced with the challenges presented by hard-to-kill weeds such as feathertop and fleabane. Alongside summer weeds, we are also presented with serious summer spraying challenges, specifically drift on tosensitive crops. With this in mind, the agronomy team at DRS felt it was important to discuss the new label requirements for the application of 2,4-D this season. On 4 October 2018, the Australian Pesticides and Veterinary Medicines Authority (APVMA) released new guidelines from their review of 2,4-D, which requires new spray drift instructions for the 2018-19 season. The focus of these changes is to reduce the likelihood of spray drift damage. This will require the use of nozzles that produce larger droplets, with a minimum of 'very coarse' spray quality category. Water volumes will have to be increased, travel speed reduced, boom height lowered, and buffer zones increased, as well as mandatory record keeping requirements. It is also recommended to increase your water rate on summer weeds and produce significantly less driftable fines. These guidelines were discussed during our WEEDit Demo Day in September, where Frank Taylor from Nufarm spoke about the new 2,4-D legislation and presented some very useful information about when to apply herbicide - with the focus on not spraying when an inversion is present. He further explained that this will indeed narrow the spraying window, however it ensures that the product used will remain at its intended target and not drift several kilometres away onto any sensitive crops, such as cotton. Mal Salisbury from Nufarm spoke about chemical resistance and how chemicals that have often been too expensive to apply in a blanket application are now beneficial and cost effective through WEEDit sprayers, where only 5-10% of the paddock is sprayed. 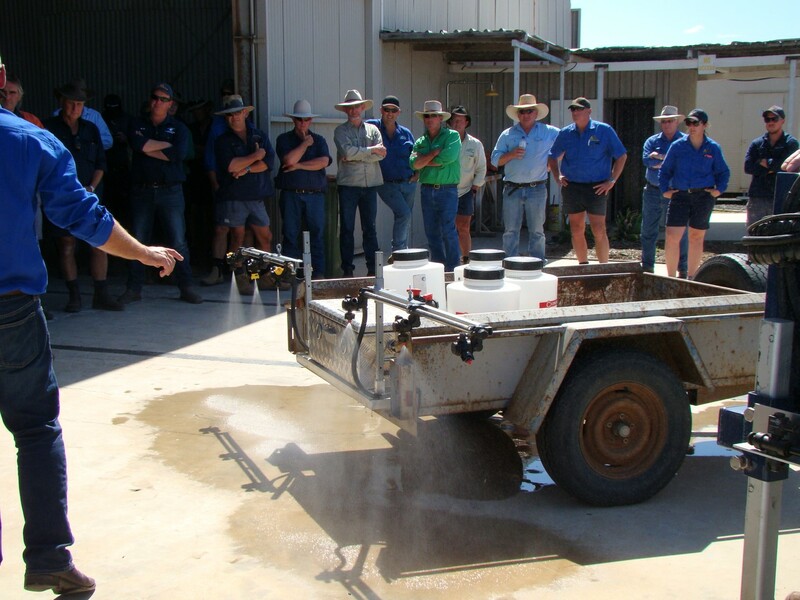 Jeremy, our Dalby Rural Supplies Precision Ag Specialist, also attended our WEEDit Demo Day, speaking about chemical rates when a WEEDit is used. A single nozzle will apply a rate of 100L/ha when travelling at 14km/h, but when 3 nozzles work to target a larger weed, the rate is effectively tripled, which can mean there is a large amount of chemical in any driftable fines that are not staying on the intended target. Jeremy discussed the coverage offered when different nozzles are used, as well as the increased coverage that slower travel speeds offer. It was also a great opportunity to look at the new toolbars on offer from Dalby Rural Supplies (being built at Rasmussen Brothers Engineering in Dalby), as well as a new 27m Hayes Linkage WEEDit sprayer which is owned by Fletcher Rasmussen of Jondaryan. Dalby Rural Supplies has a great range of tools available for use with the WEEDit sprayers designed to combat herbicide resistance and help to reduce the frustration caused by hard-to-kill weeds such as feathertop. In order to reduce drift and increase coverage, we will have to look at nozzle alternatives around sensitive crops. We are continually working hard to find new options and to ensure that the herbicides you rely on are available for years to come. If you would like further information about the new 2,4-D regulations or about our WEEDit sprayers and nozzles, feel free to email myself via jeremy@dalbyruralsupplies.com.au or phone 0458 626 101, or contact our team by phoning (07) 4660 0400.